All the useful information that you need to know before sending money with SBI Money Transfer! State Bank of India is a statutory body which offers public sector banking and financial services to its customers. It has many branches across India and outside India, where it offers NRI services and money remittance is one of them. One can send up to USD $2,000 per transaction with 10 transfers a day to the beneficiary, which is a very low maximum transfer limit. You can transfer this amount through multiple modes including bank transfer, SWIFT and wire transfer, Cheque deposit and money order. The company is also offering money remittance services in only three currencies EUR, GBP, and USD. If you are using any other currency, you might not transact with SBI, which is another drawback of it. SBI is offering 24*7 customer assistance services everywhere, so you can contact them from anytime anywhere on its toll-free number. SBI is highly secured and offer the best quality services online so that customers need not to worry about their privacy. So, on an overall basis, we rate it 7 out of 10. Pricing : How much does SBI Money Transfer cost? The company offers free money transfer services to users from across the globe. However, it charges Rs 250 for converting foreign currency. So transferring the funds is absolutely FREE with SBI except for its currency conversion fee. The company offers the rate a bit lower than that of the live market prices, as it makes money from transferring the funds. Under the pricing head, we rate it 7 out of 10 because it has lower exchange rates even if it is not charging any transfer fee. Transparency: Does SBI Money Transfer have any hidden fees? The company does not charge any hidden fee from its users, so the amount except transfer fee and GST will be reached to the beneficiary. You can track the transfers directly without logging into your account. All you need is the beneficiary’s account number and reference number and the details of the transfer will be shown to you. You can track the transfer at SBI Transaction Tracker here. Under the transparency head, experts of exchange rate IQ have provided SBI Monet Transfer 10 out of 10. Transfer Speed: How long does it take to send money through SBI Money Transfer? The company is offering instant transfers in a few countries only. So this is a major drawback and company should work on it as those who need to transfer money for any emergency purpose could not use its services. Therefore, under this head, we rate it 7 out of 10. Security : Is SBI Money Transfer Safe? SBI is a highly secured company as it is the largest bank of India so the transaction processed by it are on done by keeping in mind the Anti Money Laundering (AML), OFAC and RBI Norms. Besides this, it uses highly secure 256-Bit EV SSL encryption as well as secured by VeriSign. So, under the security head, we rate SBI Money Transfer 10 out of 10. The company offers referral benefits to its customer when any of their friends registered with the company using a referral link. It also provides benefits when any referred friend made their first transaction. The company provides promo code to its users through notification, email and SMS, which can be used to reduce the transfer cost. Under the user experience head, we rate it 8 out of 10, because its maximum transfer limit is very less and you need to send amount in fractions if you want to send a large amount. If you are already a member of SBI family and want to login, click here. 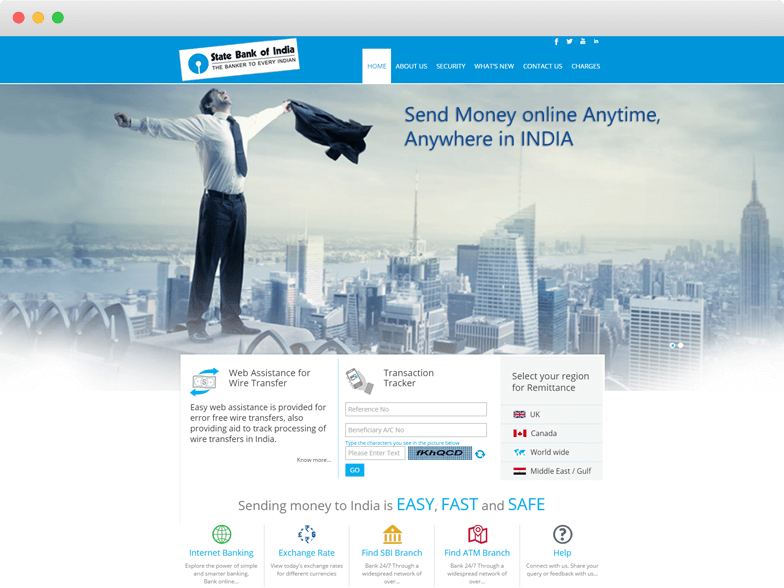 Coverage: How many Countries & Currencies does SBI Money Transfer support? So, if you are transferring currency from the above-listed countries, there are multiple ways by which you can do this which are bank account transfer, flash transfer, SWIFT and wire transfer, cheque transfer and money order. Still, there are many countries which the company is not covering and have Indian population living there, so under this head, we rate it 7 out of 10. If you want to use the services of SBI Money Transfer sign up here. Go to the SBI Money Transfer website. Here click on “Apply an Account Online” and the company will process your online account in a few days. After the account opening process completed, login to your account. Enter the details of the beneficiary. Select the bank and branch details.